We're always hearing about how Americans consume far too many calories. It turns out, though, food isn't the only thing we're gorging ourselves on. An average American digests a whopping 34 gigabytes of information outside of work every day, according to a new study from the University of California, San Diego. The UCSD researchers estimate we each ingest about 100,500 words daily from various forms of media. In all, it's about 350 percent more data than we were swallowing down just three decades ago. Geez. No wonder I have indigestion. You Consumed HOW MUCH Information? The UC San Diego study, entitled "How Much Information," analyzed the overall information flow into our minds throughout 2008. The analysts used data from a handful of places -- the US Census, Nielsen, and others -- to estimate both the amount of time Americans were spending with different media and the amount of actual data they were receiving from each source. Video, for example, would constitute more data than text. Think of it as slamming down a Big Mac vs. nibbling on a veggie sub: Both might take you the same amount of time, but the former will pack far more padding onto your precious tum-tum. The nearly 40-page study is a massive meal itself -- but there's a lot of interesting info strewn throughout its overstuffed pages. Below are some of the tastiest morsels it has to offer, broken down into bite-size snacks that are guaranteed to leave you heartburn-free. 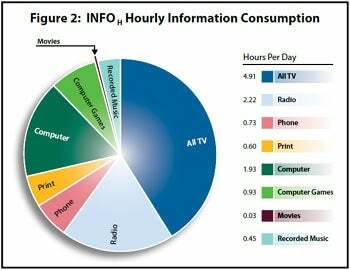 The average American receives 11.8 hours of information per day. That means you're spending about three-fourths of your waking hours ingesting info, you gluttonous scamp. We may feel like we live in front of our computer monitors, but we actually spend more time veggin' out in front of the tube. Forty-one percent of Americans' at-home "information time" is spent watching the telly, the study says. Contrary to some popular perceptions, adults are watching far more TV than teens. Americans age 60 to 65 spend more than seven hours a day being idly entertained; teenagers, on average, spend about four. This one may come as a surprise: Nineteen percent of our nonwork info-gathering time is taken up by radio-listening. The majority of that, the researchers find, is during our commutes. Believe it or not, computer use accounts for only 24 percent of our info-ingesting hours, work excluded. That includes Web-surfing, game-playing, video-watching, and whatever else you may or may not be spending two hours a week doing online (it's cool -- I'm not asking). • In sheer number of words ingested, TV also comes out on top. 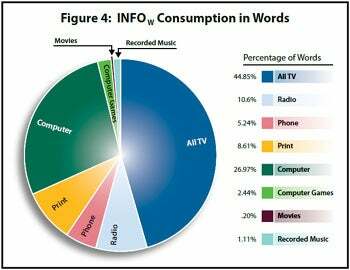 Just under half of all the media-based words we take in every day come from the tube, the UC San Diego team reports. Computer-based activity accounts for just over a quarter of our daily word diet. Altogether, U.S. families spend on average 5 percent of their info-gathering hours reading print media. We're still spending more time on landline phones than on mobile phones. Landlines take up 3.2 percent of our total info time, the study says, compared to 2.9 percent for mobile chit-chat. E-mail's the most widely used Internet service, taking up more than a third of America's total online hours. Web browsing is a close second, at about 30 percent. When it comes to computer games, men and women are equally guilty of whittling hours away. The average American gamer spent about an hour a day playing last year. Information consumption on the whole has climbed considerably over the past few decades. In 1960, an average American devoted 7.4 hours a day to receiving information of some sort, compared with the 11.8-hours-a-day estimate for 2008. While the amount of data consumed has grown immensely from the early 1980s to now (350 percent, remember? ), the number of words consumed has gone up by far less: only about 140 percent. The reason why, the researchers believe, is that we're taking in far more visual media these days -- video, images, and the like -- compared with the greater emphasis on radio and print in the past. The amount of data we now ingest would be enough to fill seven DVD discs per person, per day. That's 2,555 DVDs worth of info streaming into our pointy little heads every year at this current rate. Sheesh...I'm gonna need to stock up on recordable media. JR Raphael offers all-you-can-eat geek humor at eSarcasm, home of the world-famous Moo Goo Google dinner. You can keep up with him on Twitter: @jr_raphael.